This post is part of a virtual book tour organized by Goddess Fish Promotions. Libby will be awarding a $10 Amazon or B/N GC to a randomly drawn winner via rafflecopter during the tour. Click on the tour banner to see the other stops on the tour. This book is currently FREE on Nook and Kindle! See below for links. Grape’s entire body stiffened as she looked up from her phone. Five of the most beautiful people to ever walk the earth stood scattered around two Porsches. Did I walk into a photo shoot? The words came from an impossibly beautiful girl. Loose, raven-black locks fell over her shoulders, the tips lingering above her full bosom. Grape could almost hear the sizzle and static of her electric blue eyes. The sun had kissed the girl’s skin lightly, leaving a glow that made the air around her shimmer. Her pouty, pink, full lips begged to be kissed, though the guy standing behind her, his arm draped over her shoulder protectively, warned off all who would be so bold. The boy behind her, if anything, was even more handsome than she was beautiful. Muscle stacked upon muscle until his clothes had no choice but to hug every inch of his body. His dark eyebrows and strong jaw lent him a tough look, one that was backed up by the playful anger in his eyes. The raven-haired goddess turned and embraced her beau, her face tucked away into the heat of his chest. He sat propped up on the hood of a yellow Porsche, the sleek lines of the car offset by the disdain on his face. They were so incredibly, delightfully gorgeous that even though he looked as if he had seen a cockroach instead of a human being, Grape’s heart still melted at the sight of them. Grape snapped her gaze away from the Adonis with the nasty temperament and turned toward the twin boys standing in front of a black Porsche. Her eyes bounced between the two, taking in every perfect feature. Flawless, rich, dark brown skin. Sparkling hazel eyes. Muscles so tight that you could bounce a quarter off their abs, or arms, or anywhere on their bodies, really. They looked as perfectly engineered as the cars they stood by. But it was their lusciously long eyelashes that sent Grape swooning. Men were not meant to be this pretty. Grape’s head spun. Each person she saw was more beautiful than the last, and the redheaded girl standing off to the side was no exception. The baggy jeans and generic T-shirt she wore did not detract from her creamy skin and full lips. Her large brown eyes fascinated Grape—red flakes glimmered from inside each caramel-colored orb. The air felt charged with a million volts. Her thinking grew cloudy. Were these angels? Was she daydreaming? How did anyone get to be this beautiful? She could sense their hostility, but something inside her felt warm and gooey. Snap to, Grape, she told herself. They want to hurt you. “Awww, look. It likes us,” the twin with the goatee said. The clean-shaven twin’s face softened. Was that pity she saw in his hazel eyes? “Stop being mean,” the redhead said, sounding more bored than angry. “I’m not being mean. Where’d you buy that shirt?” Goatee asked. His quiet tone was laced with thorny edges. Grape swallowed hard. The fuzz inside her head abated. Focus, she told herself, feeling like an idiot. “I don’t know. Kohl’s maybe.” She glanced down at her blouse. The shirt was a birthday present from her mother, and she wasn’t sure where it came from, but since her mother did most of her own shopping at Kohl’s, it seemed like a pretty safe guess. The raven-haired girl glanced out from her hiding place in her boyfriend’s embrace. “It just looked familiar. I wore the same shirt. Three years ago.” She smiled, but there was no kindness when she bared her teeth. “Before it was a knockoff.” The girl hid her face against her boyfriend’s pecs. Their chests rose and fell at the same time, breathing as one. “Okay. Well, I don’t really buy designer clothes.” Grape wanted to have a witty comeback, but she still wasn’t sure where the insult lay. Did they or did they not like the shirt? What the hell is wrong with me? Of course they’re making fun of me. Why aren’t I angrier? “She means she modeled the design,” the redheaded girl said, cutting her eyes to the couple. The brothers snickered. “Pretending she doesn’t know who we are, that’s so cute. Is that the new fad amongst the Normals?” Clean-Shaven asked. “I don’t understand anything you just said.” Grape felt completely out of her depth. This was the school parking lot, but she might as well have been on Jupiter. “I thought about modeling.” Grape hadn’t meant to say that, but no one else spoke, and she felt like she had to say something. Her skin grew hot. She knew she was was blushing beyond red and into crimson mode. She’d practiced runway shows off and on in her bedroom since she was twelve, but she had never told anyone she wanted to be a model. Ever. “Ow,” Grape cried, only then noticing that she had twisted her ring so hard it was actually cutting into her finger. A tiny drop of blood oozed out and fell to the pavement below. “Aren’t you a little fat to be a model?” the boyfriend asked. His voice sounded like pure honey even when he spoke acid. “You think I’m fat?” Grape stared down at her flat tummy. No one had ever called her fat before. There was still a bit of room in the waistband of her size four skirt. “Ouch, Adam.” Clean-Shaven punched the boyfriend playfully on the arm. “I’m well within my weight range.” She could feel her voice growing high-pitched. Damn nerves. These people were jerks. “We aren’t joking,” Adam said, giving his girlfriend a quick kiss on the top of her head. Goatee pulled out his car keys. He turned his back on Grape, tired of their new toy. “Skipping,” the raven-haired girl peeked out to say. She rubbed her hands over her stomach but it still felt flat like normal. What were they seeing that she wasn’t? “The shirt looks nice on you,” Clean-Shaven said before climbing into the driver’s seat of the black Porsche. “Like a muumuu on a water buffalo,” Goatee added and hopped into the driver’s seat of the yellow Porsche. The couple got into the back of his car and huddled close together. “Mandy, you coming?” Goatee asked. Grape waved stupidly at the drivers as the engines revved. You look like a goober, she told herself, but she could not stop waving. “Move.” Mandy grabbed Grape by the arm and pulled her toward the sidewalk. Mandy stared at her with an I-told-you-so look as the Porsches sped off, right through where Grape had been standing. 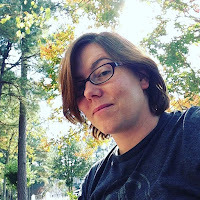 I’m a writer and improviser. I studied acting in college but spent more time rewriting lines than memorizing them. My first play, Fourth Wall, was produced my junior year. Since then, I’ve written several full length plays, one acts and screenplays. I started writing fiction in my late twenties. Now, I focus mainly on novels but still dabble in theater. Buy the book (currently FREE) at Amazon, Barnes and Noble, Smashwords, or in print on Lulu. 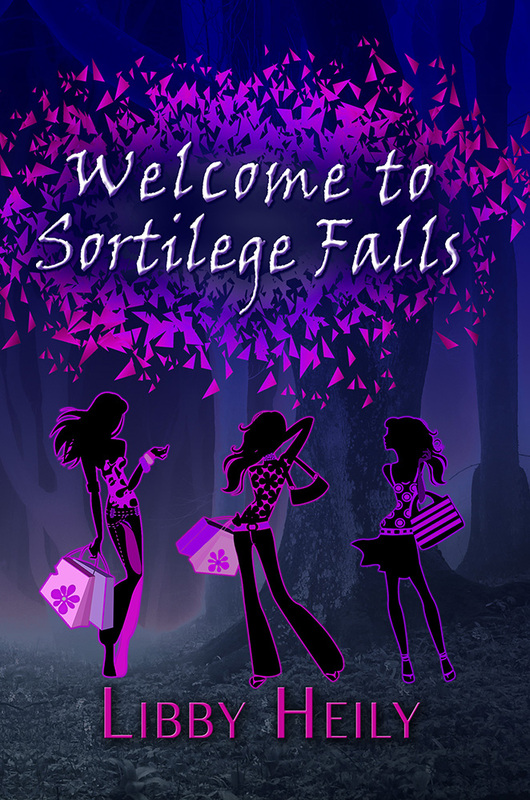 Behind the Scenes Info:“Welcome to Sortilege Falls” is my second novel. My first, “Tough Girl” was about an eleven-year-old who is slowly starving to death and loses herself in an imaginary world to combat the misery of her life. I wanted to write something happy after that and WTSF is about as “happy” as my writing gets. The idea was to come up with a main character whose very name sounds like a smile, thus Grape Merriweather was born. Stories grow and writers hardly ever end up writing the book they intended. That is definitely true with WTSF. My “happy” story grew to encompass the themes of beauty worship, celebrity, as well as delving into the mysterious relationships between child stars and their parents. In the beginning of the novel, Grape is new at school and eager to impress. She was popular back home and has never had trouble making friends. She spends over an hour the night before trying on outfits and picking the perfect one for her first day. But she is ignored by students and teachers alike. Everyone is too caught up with the beyond gorgeous models to bother with one new student. We discover this weird world along with Grape and I tried to stay true to her voice. It was very important to me that Grape wasn’t perfect, that she partially fell under the Models’ spell as well. Thanks for hosting! And the ebook is definitely free right now. I wonder if any of your readers have had an encounter with beauty/celebrity worship?